To many, he is Mr. Lynch; to others, he is Coach Lynch. 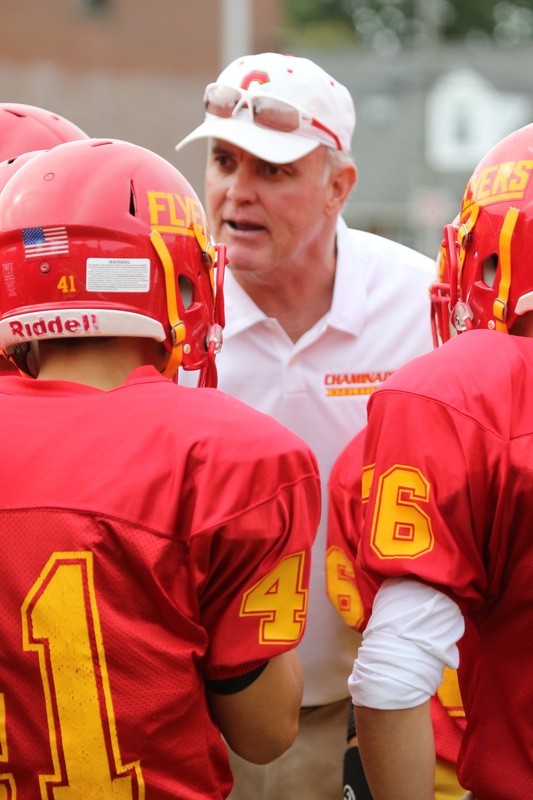 Pictured here in freshman football’s October 8 matchup against Holy Cross, Coach Lynch huddles with the Flyers. The theme of the 2017 yearbook is “Paradigm,” an exemplary figure that serves as a model for others. In the way he has always put others before himself, regardless of the circumstances, Mr. Lynch has been a paradigm for the past, present, and future of the Chaminade family. To fully understand this year’s dedication recipient, the true testament of human perseverance and the good man that he is, the context of Mr. Lynch’s story is one that must be recounted. On November 5, 1964, Christopher Lynch was born to loving parents Carolyn and Daniel in the Bronx, New York. He grew up, however, in the town of Mineola with his three sisters after the family moved when he was four years old. Not far down the road stood the building that would one day shape him, Chaminade High School. “A bit of a momma’s boy,” as he described himself, Mr. Lynch was very close to his mother. Always seeking to follow the Catholic way, she set a great example for her son by participating in the lay ministry at St. Aidan’s in Williston Park. From praying with the rosary society of their local parish to helping organize its various fundraisers and services, she showed him what it meant to truly be an active member of the Church. Mr. Lynch’s mother instilled in him the loyalty evidenced in his deep spirituality and the enduring connections he has cultivated throughout his life. Mr. Lynch credits his father with motivating him to become a hard worker. Daniel Lynch held a position in the telephone industry for 52 years and inspired his son to thoroughly pursue his own calling to pave the way towards a bright future. “My goal was always to be like him – to find my niche and stick with something I’m happy with,” said Mr. Lynch. Finding an inspiration to work hard from his father and developing a strong faith life from his mother, Mr. Lynch became the man he is today, he says, from the people who raised him. Mr. Lynch’s athletic ability was a gift he’d discover early in his youth. It turned out to be an avenue through which he met lifelong friends and built passionate bonds. While playing baseball in the Mineola Little League, he met current Chaminade history teacher and football coach Mr. Kevin Parente ’82. It was then that Mr. Lynch found the brother he had always wanted. The two became close friends soon after their first encounter 45 years ago. From spending time with each other and their families to playing high school and college football together, the two have shared countless experiences. Mr. Lynch and Mr. Parente have always been able to depend on each other for support and guidance through the years. 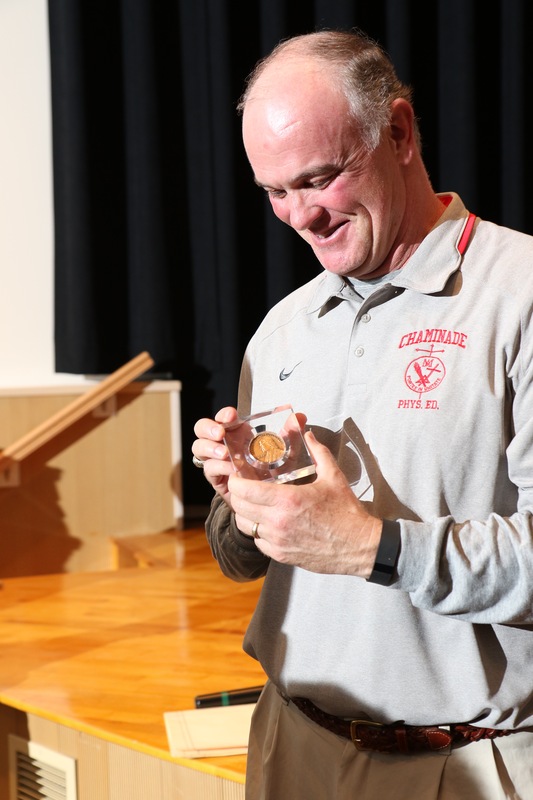 With the bright smile that always seems to be on his face, Mr. Lynch holds a generous birthday gift from the Chaminade family – a medallion of Blessed William Joseph Chaminade, given to him following his reflection at Get Colorized this past November. When the time to choose a high school came in 1978, Mr. Lynch had no problem making his decision. Although he did not know anyone who went to the school previously, the atmosphere and convenient location of Chaminade felt perfect to Mr. Lynch, and he couldn’t see himself anywhere else. He played baseball for his first two years as a Flyer and was a member of the football team throughout his entire time as a student. He continued to grow in faith as a member of Sodality and further pursued his love for sports by serving as an intramurals official. Mr. Lynch built many lasting bonds over the course of these four years. He has kept in touch with numerous people whom he met at Chaminade, and he even works alongside some of them today. While at Chaminade, Mr. Lynch also came to have an “ultimate respect” for his teachers. “I can tell you something good about every teacher I had here. They were all so caring and understanding, and they did everything they could to support me and my efforts,” he recalled. Although he had been planning to become an engineer, Mr. Lynch was rather impressed by way these men and women gave their time and attention to each individual student. After graduating in 1982, Mr. Lynch attended St. John’s University, where his mother had been working. He continued to play football with Mr. Parente for the school’s Division III program and found much success. He held down a starting position and was named the team’s second most valuable player in his senior year. The team won three championships while he was at St. John’s, and the experience was made all the more special as he shared it with one of his best friends. This wasn’t the only transformation he underwent at St. John’s. Despite his original plan, Mr. Lynch found that the engineering program was not for him after all. One of his advisors took note of how he had been coaching Little League and CYO basketball at the time and suggested that he consider teaching. At first, Mr. Lynch balked at the idea of becoming a teacher. However, he did eventually decide to take a mixture of science and education classes. When he remembered those who selflessly devoted themselves to instructing the young men back at Chaminade, he realized that this was his chance to follow in their footsteps. Considering the steadfast devotion to the Chaminade mission he has exhibited over the past three decades, it’s safe to say that Mr. Lynch has done just that. My favorite part about being here is getting to know each individual student as best as I can and ensuring that they find success in the classroom. It’s all about building relationships with them – you never know what kind of things someone is going through, so I hope I can at least help them have a great experience here. Upon graduating from St. John’s in 1986, Mr. Lynch joined Chaminade’s freshman football coaching staff and also began teaching at St. Teresa of Avila School in South Ozone Park. He started to believe that he had indeed been called to become a teacher. Six months after accepting his first teaching position, Mr. Lynch applied for a position at his former high school. After being interviewed, he went home and prayed the rosary with his family in the backyard. Surely enough, he received a call just a few days later which informed him that he had gotten the job. Mr. Lynch began teaching earth science and biology at Chaminade in 1987. Despite his lack of prior experience in the field, he quickly found what approaches worked best. Since biology was one of his focuses in college, Mr. Lynch ended up teaching that subject for over a decade until school principal Bro. Joseph Bellizzi, S.M. ’78 asked him to take over the health classes for the entire sophomore division. Instead of continuing to have members of the physical education staff rotate between different units, Mr. Lynch alone would lead the class. Teaching over 400 students in 11 or 12 different sections each year is no easy task, but as always, he was up to the challenge. In addition to freshman football, Mr. Lynch worked with the novice wrestling squad for several years in the beginning of his career. He coached both of these sports alongside Mr. Kevin Carroll, with whom he became fast friends. “From the beginning, he and I just hit it off – it’s as if we became best friends overnight,” said Coach Carroll. Coach Carroll began to pick up Mr. Lynch before every football game, and he would almost always bring him to get breakfast. One morning, neither of them had enough money to tip their waitress at IHOP. So, Mr. Lynch actually returned to the restaurant the next day, apologized, and gave her a generous gratuity. It was a small gesture that Coach Carroll never forgot, a true example of the man Mr. Lynch is. Mr. Lynch holds the cards the student body made to support him during his treatment. In Mr. Lynch’s first year of coaching, the freshman football team won the division championship. This proved to be a great start to a successful coaching career. Even when his teams do not come out on top, Mr. Lynch still carries the spirit of a winner. “During those years that we have a losing record, the kids on the team don’t ever give up or get upset because of the positive way Mr. Lynch treats and guides them,” said Coach Carroll. Right off the bat, Mr. Lynch also inherited the freshman baseball program when its head coach stepped down from the position, and he quickly built it into a consistently strong contender. More recently, he has been coaching the junior varsity hardball squad. I could talk all day about how grateful I am to know Mr. Lynch. It takes a special person to do everything he has done for me and my family. A true family man, Mr. Lynch always puts his wife and kids before himself. He treasures the time they spend together and says he would not exchange it for anything in the world. Taking after his own parents, Mr. Lynch sought to give his children a good Catholic upbringing, as both Cara and Kyle went to the Bro. Joseph C. Fox Latin School. They continued their Marianist educations through high school, as they attended Kellenberg Memorial and Chaminade, respectively. By the way he lives for those around him, Mr. Lynch has exemplified what it means to be a member of this larger family here at Chaminade. Mr. Lynch always brings a great deal of enthusiasm into the classroom, wanting his students to share his passion for what he’s teaching. He engages every student he teaches and makes it a point to get to know each one. That way, he may cater to each student’s individual strengths and weaknesses. Even those who have not had Mr. Lynch for class are likely to have fond memories of him, as he always goes out of his way to strike up conversations with students around the school building. Having taught or coached a number of current Chaminade faculty members, Mr. Lynch has often served as a role model to his colleagues. Mr. Robert O’Keefe ’04 played freshman baseball under his guidance. When Mr. O’Keefe himself began to coach the sport, he was able to learn a great deal from seeing how Mr. Lynch led his players. “He’s been a mentor, a teacher, and above everything else, a friend,” explained Mr. O’Keefe. Over the years, Mr. Lynch has deepened some of his oldest friendships, as well. He demonstrated how his relationship with Mr. Parente had endured the test of time when he asked him to be Cara’s godfather. Mr. Lynch has also continued to be there for Coach Carroll since the pair began coaching together 30 years ago. When one of Coach Carroll’s sons was battling leukemia, Mr. Lynch made several trips a week to visit and support him. Just as one man can have such a positive impact on those around him, so too does a community strengthen an individual. The relationships that Mr. Lynch has established with members of the Chaminade family throughout his time as a student, teacher, and coach have kept him going even in the most trying period of his life. This struggle was not something he saw coming. Even with all he has been through, I have not once seen Mr. Lynch in a sour mood. His upbeat demeanor is the perfect example of how to deal with the unexpected hardships life throws at you. In February 2016, Mr. Lynch was diagnosed with stomach cancer, which spread to his brain shortly thereafter. As classes resumed following winter recess, it was announced that he would be taking some time off from work. After examining his tumors and using several different methods of treatment for some time, a brilliant team of doctors from the Memorial Sloan Kettering Cancer Center in New York City performed a successful brain operation on Mr. Lynch. The affected area was bigger and deeper than they first thought, but the doctors got it all. Subsequent radiation and chemotherapy treatments have caused the cancer to shrink substantially. Together, the doctors at Sloan Kettering were able to help set Mr. Lynch on the path to good health. In fact, under the guidance of those professionals, he has already been able to return to his ordinary routine. Although he hasn’t taught this year, he is back to coaching JV baseball and often moderates physical education classes. He also stops by various health periods and his former sophomore homeroom whenever possible. Each time, no one is able to tell that this man of high energy and enthusiasm has come into work the day after receiving chemotherapy. News of Mr. Lynch’s diagnosis hit the Chaminade family hard. Having spent so much time here at his “second home” and showing compassion to everyone around him, so many people felt his absence with heavy hearts. But, from the moment the word got out about his condition, there has also existed a palpable sense of hope – a faith that there was, in fact, a light at the end of the tunnel. Since Mr. Lynch’s diagnosis, members of the Chaminade community have been supporting him every step of the way on his road to recovery. Faculty, parents, and students alike have stepped up in countless ways to say “thank you” to the man who has dedicated most of his life to their own happiness and success. Shortly after hearing the news, Bro. Joe and school president Bro. Thomas Cleary, S.M. ’81 visited Mr. Lynch at his home. They stressed that his health was their priority; he could take whatever time he needed to get better, and there would be a place waiting for him when he got back. The two promised they would help Mr. Lynch in any way they possibly could as he recovered. Similarly, fellow coach Mr. Michael Moran offered to take over all of Mr. Lynch’s health classes while he recovered. Mr. Moran is currently sharing the sophomore health classes with Mr. Thomas Paul until Mr. Lynch is ready to resume teaching. William Ellsworth, a member of the Class of 1982, organized a meatball dinner for Mr. Lynch last spring. A number of fellow graduates from that class, including Mr. Parente and Mr. Robert Hazelton, gathered in solidarity and support of their beloved friend. The dinner reflected the admiration that Mr. Hazelton has for his fellow graduate and teacher, a friend whose radiant personality does not go unnoticed. “This struggle was not something he saw coming. Even with all he has been through, I have not once seen Mr. Lynch in a sour mood. His upbeat demeanor is the perfect example of how to deal with the unexpected hardships life throws at you,” said Mr. Hazelton. From keeping Mr. Lynch in their prayers to sending him e-mails and creating get-well-soon cards signed by the entire student body, the students at Chaminade have done a great deal to support their beloved teacher and coach. 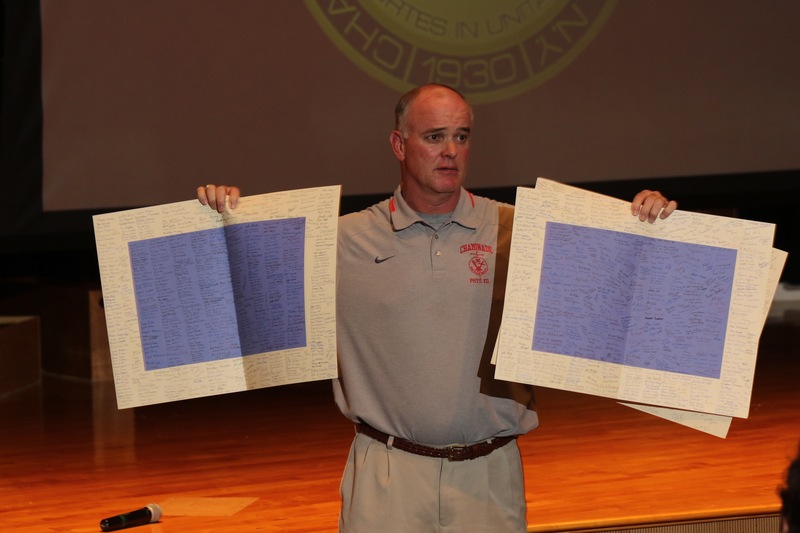 When Mr. Lynch first returned to Chaminade towards the end of the 2015-2016 past school year, he received a standing ovation in the cafeteria, gym, and just about every classroom he entered. As humans, we cannot prevent adversity, but we can always choose how to conduct ourselves in its midst. We truly reveal our characters through the way we respond when things don’t go our way. The past year has been a struggle of unparalleled difficulty for Mr. Lynch, yet his bright smile has not once faded. He has not lamented his condition; rather, his unquestionable faith in God and His Providence has filled him with a calm confidence throughout his suffering. “Everything happens for a reason – I have no doubt about that. God puts us on this earth with a purpose, and I believe that mine is to help people become the best they can be. I know that in some way, my fight with cancer is just one part of His plan for me,” said Mr. Lynch, smiling. Posted in Features and tagged coach lynch, mr. lynch, yearbook. Bookmark the permalink.